April 12, 2016. Phoenix, Arizona – When 40 million liters of toxic leaching material and heavy metals from Grupo Mexico’s Buenavista del Cobre copper mine spilled into the Bacánuchi and Sonora Rivers in northern Mexico in 2014, the contamination affected over 25,000 people who depend on the rivers for water consumption and their livelihoods. Today, with the assistance of the Project on Organizing, Development, Education, and Research (PODER), the Law Office of Lynn Coyle PLLC, and EarthRights International (ERI), these communities turned to a United States federal court to support their ongoing legal battle. In 2015 and again in 2016, survivors filed a number of actions in Mexico in an attempt to get the mining company and the Mexican government to clean up the disaster and compensate the victims, but after almost two years residents continue to suffer from the impacts. Today, the communities turn to the Buenavista mine’s parent company, Southern Copper Corporation, for answers. Southern Copper, a publicly-traded U.S. company headquartered in Phoenix, owns the Buenavista mine and other mining subsidiaries of multinational conglomerate Grupo Mexico, which is the largest mining company in Mexico as well as the fourth-largest copper miner globally. As Buenavista’s parent, Southern Copper has information relating to its operations and environmental practices, including information about the toxic spill. Using a federal statute, the survivors of this disaster can seek U.S. court assistance in these actions. The Foreign Legal Assistance (FLA) statute, 28 U.S.C. § 1782, gives federal courts the authority to order documents and testimony to assist in foreign legal proceedings. The affected agricultural communities hope to use these documents and testimony in the Mexican actions. A number of factors contributed to the cause of the spill, including a lack of a safety valve to catch the leak, the lack of overflow ponds and impermeable linings, and environmental permits, among others. All of these are attributable to the non-compliance of environmental standards on the part of Buenavista del Cobre. The information that Southern Copper can provide would show not only what caused the disaster, but also what those responsible did or failed to do leading up to it, and whether they knew that their actions or inactions could cause these harms. 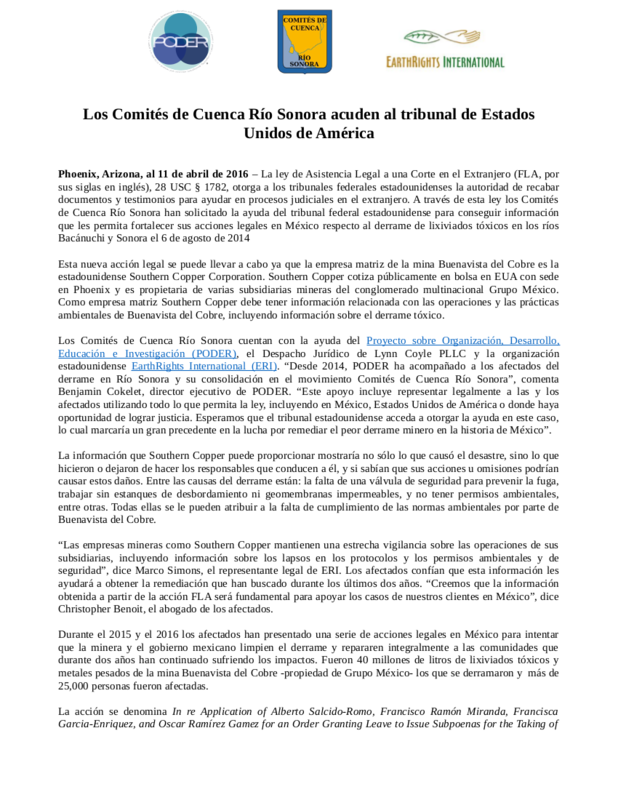 “Mining companies like Southern Copper keep a close eye on the operations of their subsidiaries, including information on lapses in environmental and safety protocols and permits,” says Marco Simons, ERI’s general counsel. The victims are confident that this information will help them obtain the remedies that they have been seeking for the last two years. “We believe that the information garnered from this FLA action will be integral to support our clients’ cases abroad,” says Christopher Benoit, attorney for the survivors. The action is In re Application of Alberto Salcido-Romo, Francisco Ramón Miranda, Francisca Garcia-Enriquez, and Oscar Ramírez Gamez for an Order Granting Leave to Issue Subpoenas for the Taking of Discovery Pursuant to 28 U.S.C. § 1782, Case No. MC-16-0035-PHX-DLR in the U.S. District Court for the District of Arizona.